Saints alive! Great resources for free! Regular readers will know that the Lentorium is chock-full of wondrous gems and glorious tchotchkes at bargain prices. But not everything great costs money. Some of the best things in life are free, and that’s why we’d like to make sure our global reading public knows about some excellent free resources from Forward Movement, the official sponsor of Lent Madness. The Celebrating the Saints curriculum is a free year-long study of the lives of the saints. Celebrating the Saints equips facilitators and youth and adult participants to follow Jesus while learning more about twenty-six of the monks, missionaries, prophets, doctors, evangelists and more who are named saints in the church’s calendar. Celebrating the Saints is designed for use in weekly youth and adult formation times and lessons are easily adaptable. Each hour-long class stands on its own and can be used independently or rearranged in any order. The curriculum provides course overviews, step-by-step instructions, discussion questions, activity suggestions, and handouts for the participants. If you are using the guide on computer, tablet, or smartphone, the hyperlinks are enabled. Celebrating the Saints also offers corresponding lessons for children. This all-ages format allows families to learn about the same topic, each in their own class, and have a shared starting point from which to talk, discuss, and learn together when you return home. You can learn more or download the courses (children or youth/adult). The course is also available in Spanish. If you want to see a preview, here’s the children’s course sample or youth/adult course sample. 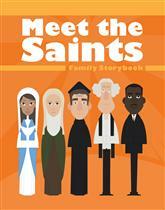 The Meet the Saints: Family Storybook is a printed book — which makes a nice gift for parents — that provides twenty-four stories of saints for families to read together, colorful child-friendly illustrations, thoughtful questions for family conversations, prayers to pray together, and coloring pages for children to enjoy. Using this printed, full-color version of the Meet the Saints: Family Storybook families can together unveil how Christ’s light has shone brightly in the lives of men and women through centuries. Meet the Saints is just $10 on sale. Celebrating the Saints is part of the Living Discipleship series of offerings, funded by a generous grant from The Episcopal Church’s Constable Fund. With this financial support, we are able to offer the curriculum free of charge as a download to any Episcopal church. In addition, Forward Movement is joining with The Constable Fund to offer ten free copies of the printed Celebrating the Saints: Family Storybook to congregations with an average Sunday attendance of 50 or less. Please contact us at 800-543-1813 to place the order. Shipping is additional. We hope these free resources will be helpful for your congregation. And Meet the Saints would be a lovely addition to your family’s life if you have kids at home. Sometimes people say they want Lent Madness to continue year ’round. Well, Meet the Saints can help you keep the madness going in your home. 8 Comments to "Saints alive! Great resources for free!" Oh man, I was getting all enthusiastic about this excellent free resource and picturing myself going Lent-mad all year celebrating the saints . . . and then I read down to the bottom and found out that in order to get this glorious freebie I have to be an Episcopal church. Oh well. Nah, you can download it. The free books we ship are for Episcopal churches, but anyone or any church is welcome to download the free curriculum. Please, enjoy it! Thank you for the freebie! I’m enjoying all this Madness, learning about the saints and discovering what a hoot you all are! This is turning into a great Lent! Where do I go to download Celebrating the Saints? There are direct links in the Saints alive! post that ran yesterday. You’ll have to go through the checkout process at Forward Movement, but there’s no cost. I have been using this book for almost 2 years now just adding more Saints that come up during the week. We love this book & have learned so much. Would highly recommend! You had me at Enmegahbowh…!